It didn’t take long into Jason Kidd’s brilliant NBA career, for No. 5 to show just how special he was. On Feb. 8, 1996, just halfway through his second NBA season, a young J-Kidd dazzled Mavericks fans with an incredible performance, highlighted by a career-high in assists that would stand for the remainder of his illustrious career. On this date 23 years ago, J-Kidd totalled a remarkable 25 dimes, and added 20 points, in a thrilling 136-133 double overtime Mavs victory. What’s more is that the performance came against one the league’s best teams, the Utah Jazz, led by one of Jason’s idols, John Stockton, the only player to dish out more career assists than J-Kidd. Little did the fans who settled into their seats at Reunion Arena that night know that they were about to witness a historic battle between two of the best ever to play the point. Not only did Jason set a personal best in assists, the mark was also the most assists ever recorded by a single player in any game played at the venue, which was home of the Mavericks from 1980-2001. 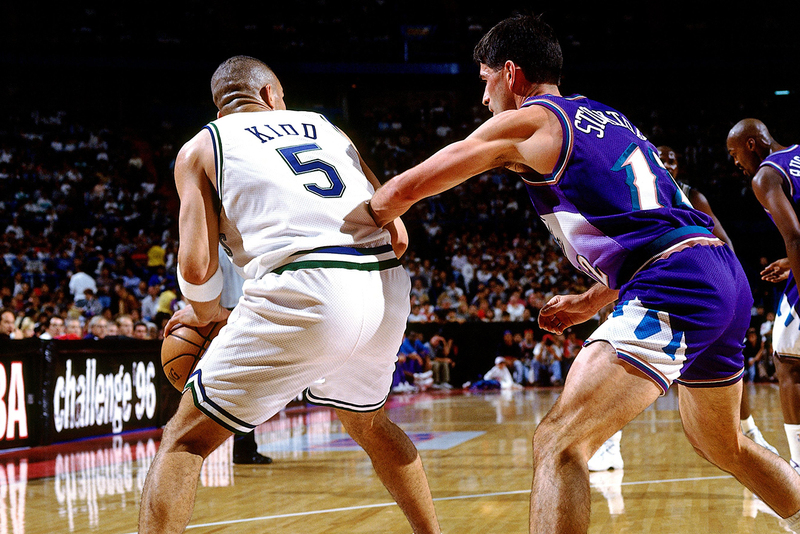 Though Jason was still just a pup when he and Stockton matched up on that February night in 1996, the matchup was already the eighth time they had met, in a total of 28 matchups between the two Hall of Fame point guards. Stockton and his championship-calibre Jazz team, often got the best of Jason’s squad’s, but J-Kidd pulled out all the stops for his team emerge victorious in this particular contest. Jim Jackson and George McCloud were the primary beneficiaries of Kidd’s dazzling passes as they combined for 70 points in the win. The game was close throughout, finally being decided in double overtime. In the extra periods, Kidd was all over the court, earning a standing ovation from the home crowd for his defensive efforts — in addition to his work on the offensive end, he had four steals — finding his teammates for clutch shots down the stretch, and hitting a couple big shots of his own to lift his Mavs over a very talented and experienced Jazz lineup that featured a pair of Hall of Famers in Stockton and Karl Malone. Ultimately, the trio of Kidd, McCloud and Jackson was just too good to beat on this day in 1996.